On 5th February 2016, Queen Jetsun Pema gave birth to her first child, a son, at the Lingkana Palace in Thimphu, the capital of the last Himalayan kingdom of Bhutan (Drukyul – Land of the Thunder Dragon). The royal birth of His Royal Highness The Gyalsey will most likely indicate the further entrenchment of two major trajectories in Bhutan’s political development. First of all, it might ensure the continuation of the Royal Dynasty. Second, when His Royal Highness The Gyalsey will take over the responsibilities as the 6th Druk Gyalpo (Dragon King) from his father, current king Jigme Khesar Namgyel Wangchuck, he may continue the cautious and gradual but persistent process of democratization in Bhutan. The latter phenomenon comes with a strong Bhutanese flavour but in sum one can state that democracy has arrived in Bhutan. But the way democratization has been carried out so far has come with certain side-effects. First of all, it has helped to create a new urban middle class benefitting extraordinarily from the introduced reforms and power-sharing arrangements compared to the mass of the common people, living in remote rural areas. Second, it has produced a high amount of unemployed youth. It is argued here that both phenomena are marking developments which could lead to severe challenges for the continuation of the country’s smooth process of reform and democratic transition. The major current and upcoming tasks of the royal dynasty and the political-economic elites in Bhutan need to be to continue the ongoing changes but also to find mechanisms to reverse the existing economic and political inequalities. Otherwise, the much appraised ‘social harmony’ in Bhutan will be at stake. His Royal Highness The Gyalsey belongs to one of Asia’s most remarkable monarchies, determining all spheres of state and society since modern Bhutan came into existence. As a land-locked country which is bordered in the north by China and in the south by India, it was a late starter in the process of state-building. Generally Bhutan’s political development can be divided into three major periods. First, the theocratic era from 1616 to 1907; second, around 100 years of monarchy under the rule of the Wangchuk dynasty; and third, the era since 2008 when Bhutan became the world’s youngest democracy after passing a new constitution and holding the first National Assembly elections. After the initial diarchy of lay and ecclesiastical leadership in Bhutan agreed to establish a hereditary monarchy and a coronation agreement with the British was signed, Sir Ugyen Wangchuk, the son of the 51st Druk Desi and influential pro-British governor of Tongsa, became Bhutan’s first king in 1907. This marked not only the founding of the Bhutanese state but also the end of civil-war and the conflict with the British Raj in South Asia. Ugyen was succeeded by his son Jigme Wangchuk (1926–52). Under the latter’s reign, the rule of the Wangchuk dynasty became further entrenched, with the country becoming consolidated and brought under the direct control of the absolute monarchy (Mitra, Wolf and Schöttli 2006). Having this in mind, one could state that the major achievements of the first two kings were a smooth and successful opening towards ‘the outer world’ as well as securing power and legitimacy for the dynastic rule of the Wangchuks. The third king, Jigme Dorji Wangchuk (1952–72), can actually be seen as the ‘father of modern Bhutan’ (Sinha 2004). His decisions to develop and modernize the country included an active promotion of education, technological development, and political reform. He abolished serfdom and slavery and carried out major land reforms (Singh 2010). The fourth monarch, Jigme Singye Wangchuk (1972-2006), continued his father’s modernization policies, yet remained equally committed to upholding a centralized and uniform culture, attaching more value to Gross National Happiness (GNH) than simply rapid economic development. Furthermore, he focused on the construction of a collective identity to produce a base for national ideology. Critics identify this national identity project as causal for a restrictive cultural policy (Driglam Namzha) which was branded as the ‘Bhutanization’ of the people, especially those of foreign descent. However, it must be seen as a continuation of ‘ideological engineering’ which had already begun in 1963, as the king altered his title to Druk Gyalpo, with the aim of asserting a distinct Bhutanese identity. In 2006, the fifth and current king Jigme Khesar Namgyel Wangchuk ascended to the throne. Like his predecessors, he knew that sooner or later there would be a democratic challenge to an absolute monarchy and has tried continue policies of cautious socio-economic and political modernization and development. First of all, one cannot deny that the decision of the king to deliberately give up much of his power to his people – as a ‘royal gift’ (or kidu) that transforms the country from an absolute monarchy into a parliamentary democracy – is a rare phenomenon in the world. The rationale behind such a process is usually twofold. The establishment of democracy is an elite-driven process in the form of a top-down model; in other words, ‘democracy from above’. As such, it is not an outcome of a socio-political movement or a revolutionary act. Additionally, it should may be argued that it was a move by the king to voluntarily share power before he was forced to do so. However, one can state that Bhutan underwent a major and mostly peaceful transformation from direct royal rule to a constitutional monarchy over the course of 18 years. Generally the processes of democratic transformation from authoritarian monarchical rule towards parliamentary democracy were initiated by Jigme Wangchuk. In 1953 he guided Bhutan towards a constitutional monarchy by establishing a National Assembly (Tshogdu Chenmo) over which he initially retained veto power. In order to strengthen the legislature, his 1968 decree furnished the National Assembly with institutional sovereignty and the power to remove the king through a vote of no-confidence (based on a two-thirds majority), coming into force in 1969. These political reform measures also included the introduction of a Royal Advisory Council (Lodoi Tshogde) in 1965 and a Council of Ministers (Lhengye Zhungtshog) in 1968 ‘as a broad based royal consultative body’ to differentiate and institutionalize the executive branch of government. In order to establish a political system of checks and balances the king undertook major reforms regarding the organization of the judiciary. In order to separate the judiciary from the executive and legislative a High Court (Thrimkhang Gongma) was established. Jigme Dorji’s successor, Jigme Singye Wangchuk continued the democratic reform process (Mathou 2008). In 1998 the monarch dissolved the Council of Ministers, announcing that ministers formerly appointed by him would instead be approved by the National Assembly. This was a far reaching step because the king not only dissolved his own government but also transferred his powers to this new elected executive. The resultant Council of Ministers was given more control over state affairs, with the head of government rotated annually among the cabinet members and the king remaining the head of state. The first draft of a new constitution was presented in December 2002, envisaging a parliamentary democracy with a constitutional monarchy. A revised version proposed by the king has been under discussion since March 2005 and foresees fundamental changes to the political procedures and institutions. Moving towards a democratic constitutional monarchy, on 18 July 2008 Jigme Khesar Namgyal Wangchuck signed the constitution which marked formally the end of a century of absolute royal rule. In addition to the establishment of a multiparty democracy, the notions of a separation of powers and a system of checks and balances were further institutionalized into the political system of Bhutan with this latest political reform. The executive power is now vested in the Lhengye Zhungtshog (Council of Ministers) which functions as a cabinet and is headed by the Prime Minister. This council is to aid and assist the king who remains the head of the state. The legislative power lies with the bicameral parliament which consists of the king and the two houses: the National Assembly (lower house) and the National Council (upper house). Additionally, to strengthen the democratization process and to enhance public participation, Bhutan’s reform efforts have, in the last few years, been aimed at the development of local government bodies (e.g. Block and District Development Committees) and equipping them with the authority to execute socio-economic programs. The peak of the democratic transition was marked by the first parliamentary elections in 2008, the successful end of the tenure of this first parliament, and the subsequent second parliamentary elections in 2013. However, after two decades of an elite driven process of political and socio-economic development, it seems it has come with a prize. Even though the country has demonstrated its ability to hold successful elections, one cannot help getting the impression that the smooth, overall process of transition is starting to lose some of its appeal and glamour, especially for the uneducated people who are confronted with fewer socio-economic opportunities in the country. Despite the fact that government friendly media put in much effort to evoke a democratic buzz in the country, there was a remarkable drop of eight per cent in the voter turn-out in 2013 compared to 2008. Still, one can state that regarding quantitative indicators Bhutan’s economy is performing reasonably well. Nevertheless, it is argued that this is partly due to the ‘silent emergence’ of social, economic and political rifts among the Bhutanese. These grievances are reflected in the growing polarization of the society. It is stressed here that the appearance of polarization is due to the growing disparities based on an increasingly distorted access to economic and political resources. 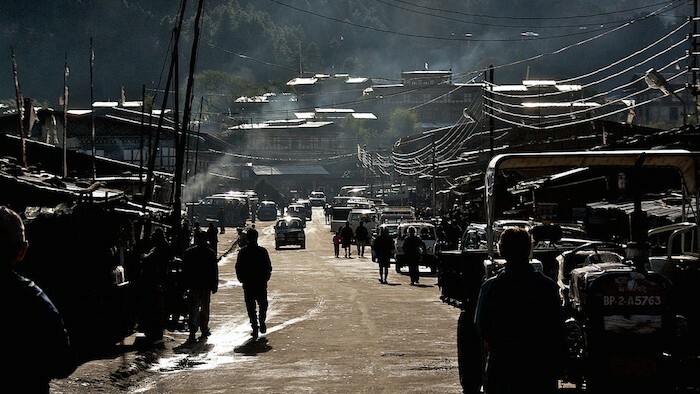 This phenomenon finds expression in a slowly-emerging rift between the small newly-urbanised and educated middle class vis-à-vis the rural people who constitute the bulk of the Bhutanese population. The latter phenomenon finds its expression in a remarkable rural poverty. UNICEF points out that the income poverty remains predominantly a rural phenomenon, with 98 per cent of the poor residing in rural areas, where about a third of the population (31 per cent) are classified as poor, compared to less than 2 per cent in urban areas. In order to understand this, one should keep in mind that politics in Bhutan still remains an exclusive and, as indicated before, elite-driven process. However, Bhutan’s political elite does not comprise merely the king and his closest advisors. Rather, elitist politics are characterised by an informal but persistent and mutually-influencing interaction between the royal family and the newly-emerged middle class. This small but growing middle class consists of bureaucrats and an increasingly vocal group of economic entrepreneurs in the country’s few ‘urbanising centres’. Because of their economic interests, Bhutan’s middle class was instrumental in the opening up of the country, and they are also a driving force behind the ongoing democratization process. Despite some slight improvements, another significant challenge is the relatively high unemployment rate among the urban youth of 9.4 per cent in 2014 (9.6 per cent in 2013). The idea of mutual consultancy in the political decision-making process is nothing new in Bhutan. Its origins date back to the old Chhoesi system, which was a dual concept of government that prevailed from 1650 to 1907, comprising a temporal head (Druk Desi) and a religious leader (Je Khenpo) as the leading institutions of the country’s socio-political system. It was established by Ngawang Namgyal, the founder of the ‘modern’ state of Bhutan, and is recognised as a significant landmark in the genesis of Bhutan’s structure of governance. Various aspects of the Chhoesi-system still exist and continue to play a significant role in the country’s development process. This finds expression not only in the fact that the religious institutions still have a significant say in political decision-making processes, but also in the idea that political processes are based on power-sharing, mutuality and exchange. The contemporary power-sharing system was enhanced through the broadening of the country’s political and economic upper crust, combined with the appearance of informal inter-elite arrangements. This phenomenon can be best seen in the behind the scenes incorporation of members belonging to the middle class, especially of those who received specialised higher education abroad, in the political decision-making process. In sum, the democratic transition is not a process that was ordered by the king only; it was also initiated and supported by a middle class which is guided by its own interests in enhancing democratic enthusiasm in the country. Without the help of this middle class, neither the build-up of functioning institutions nor the introduction of meaningful elections would have been possible. Taking into account the country’s contemporary social, political and economic challenges as well as the king’s self-conception as a guarantor of Bhutan’s democratisation project, it will be very much unlikely that the king will in future perform only a symbolic function. The degree of political reforms which could be described as a kind of ‘monarchical guided democracy’ can be seen as the most clear and institutionalized indication of this trend. However, after the second successful parliamentary election (2013) the transition towards democracy is irreversible and on the right track. As in any other country, a process with such tremendous impact on state and society does not come without any side-effects. First of all, it created a power vacuum which got immediately filled with the newly-emerged and largely-foreign-educated middle class. It was perceived by the politically-aware segments of the rural population that the rising significance of this class was or would be at the expense of the traditional stakeholders like village representatives as well as the uneducated, poor population. In this context, the concerns of the educated but unemployed youth have to be taken into account. If not, either the country will suffer from a costly brain drain which will be harmful for the future, or they could transform in a critical factor challenging the social harmony and peaceful democratic transition if they are not adequately integrated into the political and economic transition. In order to contain the negative side-effects of the democratic transition the following things have to be taken into account: First, the current decision-making processes and power-sharing arrangements have to be more inclusive. Second, the socio-economic inequalities have to be reduced by a fair mechanism for the distribution of national wealth. Third, measures have carried out to strengthen Bhutan’s civil society, especially by further empowering the rural population and improvements of the living conditions in remote areas. It will be crucial to incorporate the rural population into the political process. Until now, the people in the underdeveloped isolated mountainous areas showed only limited interest in taking part in the elections either as candidates or as voters. Much more has to be done to build up awareness among the rural Bhutanese about the benefits of political participation and their ability to have a say in matters that relate to them. With this in mind, there will be much hope that His Royal Highness The Gyalsey, when he will one day take over the royal affairs in Bhutan, that he will continue the peculiar, but cunning and relatively successful processes of transition. Additionally, although the affection of the people towards the monarchy is deep, it is crucial that more Bhutanese familiarize themselves with the new political developments and that they understand that there is no contradiction between practising democracy and appreciating their king and traditions. In sum, the king must ensure that more actors are incorporated in the country’s decision-making processes and that civil society is strengthened. If this should fail, the state in Bhutan will remain an exclusive business run by the elite rather than a participatory democracy. Ardussi, John A. (2004), ‘Formation of the State of Bhutan (’Brug gzhung) in the 17th Century and its Tibetan Antecedents’, in Journal of Bhutan Studies, Volume 11. Mitra, Subrata, Wolf, Siegfried O., and Jivanta Schöttli (2006), A Political and Economic Dictionary of South Asia, Routledge: London. Rahul, Ram (1997), Royal Bhutan. A political history, Vikas, New Delhi. Ramphel, Norbu, (2000), Historical Foundations and Political Evolution, Anmol Publications, New Delhi. Ramphel, Norbu (1999), Bhutan: Emergence of a Nation State, Anmol Publications, New Delhi. Rose, Leo E. 1977, The Politics of Bhutan. London, Cornell University Press, London. Singh, Shilpi (2010), ‘The Wangchuck Dynasty – Transformation of Bhutan From Within’, in Madhu Rajput (ed. ), Bhutan – From Theocracy to Democracy (Jaipur: Gauttam Book Company). Sinha, Awadhesh Coomar (2004), Himalayan Kingdom Bhutan: Tradition, Transition, and Transformation, Indus, New Delhi. Mathew, Joseph C. (1999) Ethnic conflict in Bhutan. New Delhi: Nirala Publ. Mathou, Thierry (2008). How to Reform a Traditional Buddhist Monarchy. The Political Achievements of His Majesty Jigme Singye Wangchuck, the Fourth King of Bhutan (1972-2006). Thimphu: The Centre for Bhutan Studies. Upreti, Bhuwan Chandra (Ed. ), 1985, Bhutan. Dilemma of Change in a Himalayan Kingdom, Chand, Delhi. For a detailed account on the early history Bhutan and its political developments, please consult: Ardussi 2004; Rahul 1997; Ramphel 2000 & 1999; Leo 1977; Upreti 1985.